I said goodbye to Sheila, and bid the Grand Tetons farewell, driving eastward across Wyoming. At a rest stop I found the "Hack Memorial" along the Wind River. Hack Men made the cross ties for the Chicago and North Western Railway through Wyoming. Hardy woodsmen literally "hacked" the square ties from logs, and river men delivered them by floating them down the river. My next rest stop took in the Bighorn Sheep Interpretive Center in Dubois. I stopped for a night of free parking at Wind River Casino. Since it was my birthday month I received a free dinner and early morning breakfast in their restaurant, and $15 of free play on the slots. The $15 turned into $50, so I went to bed full, tired, and happy. In the morning I followed the Wind River and entered an area where the Oregon Trail, Mormon Pioneer Trail, and Gold Rush trails merged for a ways. I guess that's the Wind River Range in the distance...been a few days since I took the picture, lol. Sheila told me about how her ancestors traveled to Salt Lake along this trail, and about the tragedy that befell one group of Mormons who were stranded in a snowstorm near here. This is the first sign I came to that mentions that incident. But just a mile farther on I come to the location of the "Sixth Crossing." A wonderful museum tells the story about the Willie Handcart Company. Travelers along the Mormon Pioneer Trail used handcarts instead of covered wagons to carry their possessions. It was faster and more economical. The Sweetwater River had to be crossed 6 times. This is the site of the final crossing. An example of what might be packed in a handcart. This exhibit focused primarily on the women making the journey. Travelers began their journey by crossing the ocean from Europe and making their way west to Utah. They started their trek on foot with the handcarts in Iowa. When they were stranded, they quickly ran out of rations. An account of the rescue. Brigham Young, hearing of their plight, called on followers to go and find them with wagons carrying food and supplies. A painting showing rescuers searching for the stranded amid a blizzard. Another painting depicting angels helping to pull the handcarts when the travelers felt they could not continue. Many unfortunate travelers did not make it. Continuing eastward I came to this place, a source of water for travelers on all the trails, and especially welcomed by summer travelers. 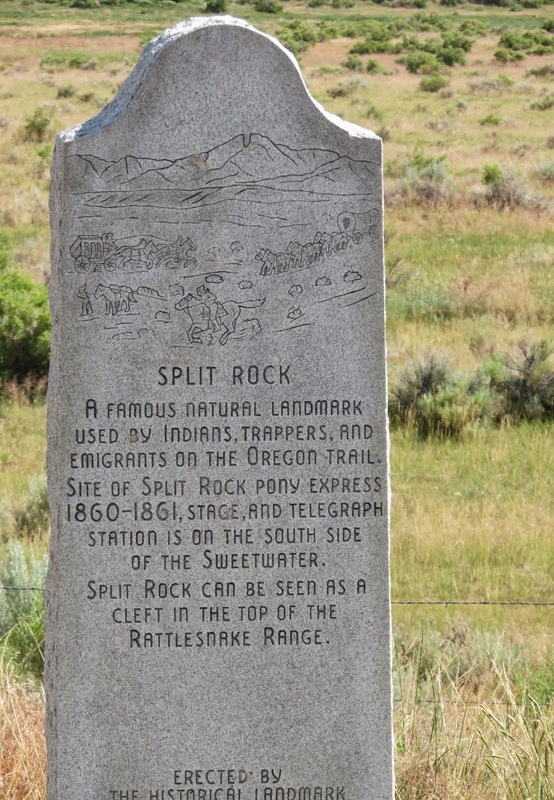 Another landmark for travelers on the Emigrant Trails was "Split Rock" which could be seen for several days. Climbing on the rocks near Split Rock. Looking down on the site of the Pony Express Station. Another rescue site of the Mormon Pioneers of the Martin Handcart Company. The company led by Captain Edward Martin got a late start, departing on its ill-fated journey from Iowa on July 28, 1856 with 600 immigrants, most of whom have come to America from England. Devil's Gate is another historic landmark. Since the river gorge is impassable to wagons, the emigrant trails merged at this point passing to the south. Deep trail ruts are still visible. Routes of the Oregon Trail, California Trail, Mormon Trail, and Pony Express Trail all passed through the Sweetwater Valley. Mormon Handcarts with Devil's Gate in the background. Prairie Park remembers the disastrous journey of the Martin Handcart Company in stone relief. The crossing from Europe in 1856. Voyageurs were hopeful and filled with anticipation. Members of the Martin Company were found by scouts near Independence Rock, east of here and brought to this location to await more rescue wagons and to administer aid. Visitors have the opportunity to experience pulling a handcart, and can even arrange an overnight "trek," camping out at Martin's Cove. Groups of Mormons often do this as a way of honoring their ancestors. And pull it down that trail. And that way to the campgrounds. I crossed the Sweetwater River via bridge and hiked the trail to Devil's gate instead. Devil's Gate. More than 20 graves are thought to be located in this vicinity, although only one is marked, and many emigrant inscriptions can still be found on nearby rocks. Trekking back the other way. Fort Seminoe was a stop and supply station for emigrants. Rescuers helped the Martin Company reach the stockade on November 2. It was 11 degrees below zero. A cabin was knocked down to provide firewood. 13 emigrants died that night. Farther east, I stopped at Independence Rock, another landmark for emigrants. A trail leads out to see the names inscribed on the rock. Lookout Hill in the distance gave emigrants their first glimpse of landmarks such as Independence Rock and Split Rock. Thousands of emigrants inscribed their names here, but they are hard to find. I found a few legible names and dates beneath an overhang...probably better protected from the elements. I was surprised to see people climbing on the rock...would think that it would be better protected to preserve the history. I did indeed feel as though I walked on hallowed ground that day.